Background: Aging is the inevitable fate of all living organisms, but the molecular basis of physiological aging is poorly understood. Oxidative stress is believed to play a key role in the aging process. In addition to Reactive Oxygen Species (ROS), Reactive Nitrogen Species (RNS) are generated during aerobic metabolism in living organisms. Although protein damage and functional modification by ROS have been demonstrated in details, fewer studies have been reported on protein damage by RNS and its implication in the aging process. Proteins undergoing tyrosine nitration are associated with pathophysiology of several diseases, as well as physiological aging. The purpose of the current review article is to provide a brief summary of the biochemical mechanisms of tyrosine nitration, methodologies used for the detection of these modified proteins, effect of RNS induced post translational modification on biological functions and the putative role of tyrosine nitrated proteins in the aging process. Methods: Published studies on the role of RNS in age related functional alteration of various organs/ tissues were critically reviewed and evaluated. Results: Covalent modification of various proteins by tyrosine nitration is associated with modification of biological functions of various organs/tissues such as skeletal muscle, heart, brain and liver due to aging. Conclusion: This information will be helpful to further investigate the interplay of different biochemical pathways and networks involved in the tyrosine nitration of various proteins due to aging with the ultimate goal to prevent the detrimental effects of RNS on the functional activities of these proteins. Keywords: Protein modification, tyrosine nitration, aging, oxidative stress, aerobic metabolism, nitrosative stress. Keywords:Protein modification, tyrosine nitration, aging, oxidative stress, aerobic metabolism, nitrosative stress. Abstract:Background: Aging is the inevitable fate of all living organisms, but the molecular basis of physiological aging is poorly understood. Oxidative stress is believed to play a key role in the aging process. In addition to Reactive Oxygen Species (ROS), Reactive Nitrogen Species (RNS) are generated during aerobic metabolism in living organisms. Although protein damage and functional modification by ROS have been demonstrated in details, fewer studies have been reported on protein damage by RNS and its implication in the aging process. Proteins undergoing tyrosine nitration are associated with pathophysiology of several diseases, as well as physiological aging. 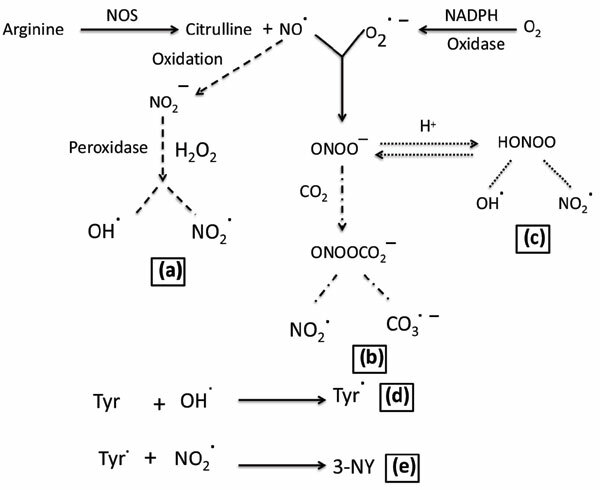 The purpose of the current review article is to provide a brief summary of the biochemical mechanisms of tyrosine nitration, methodologies used for the detection of these modified proteins, effect of RNS induced post translational modification on biological functions and the putative role of tyrosine nitrated proteins in the aging process.